Looking to extend your customers’ experience outdoors? Flimsy umbrellas and plastic tables really don’t cut it as outdoor restaurant seating these days. Whether you are contemplating a patio for your restaurant, a retail courtyard or an outdoor meeting place for your team, let us help you bring your vision for an outdoor space to life with lighting, sound, and entertainment features that reflect your design aesthetic. Worried about keeping your technology outdoors year round? 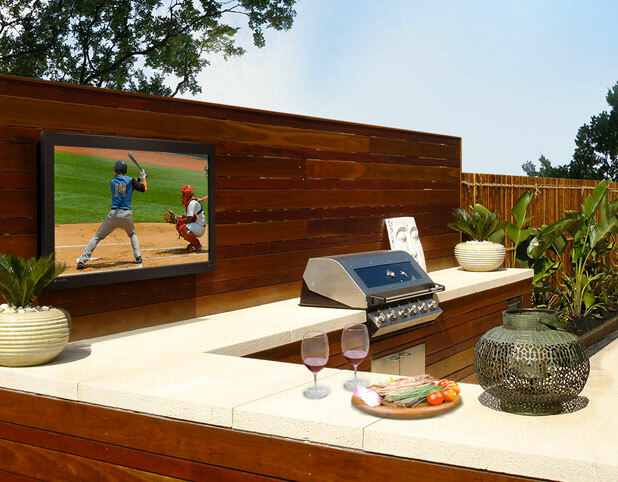 We have television and sound systems that are built to withstand rain, heat, and even the coldest Canadian winters, so that you can be assured that your technology will look and function as well 5 years from now as it does the day it is installed. Trust us to bring you the best solutions from our partners who specialize and guarantee high quality, outdoor solutions. Take the whole outdoor experience up a notch and make your outdoor space the most coveted place to be in your business.